DESIGN YOUR OWN COUTURE TEE Yes, its true, and it's very simple. 1st- Select your Image theme, leave "AS SEEN" or Give us 2-3 themes for the art on your COUTURE TEE. Don't worry, what ever you mention we will use as inspiration to create some amazing art for your COUTURE TEE. Previous customer theme examples include, "Lobsters", "Stars", "Paris", "See where I'm going with this...anything", "Orchids", "Bears". Anything is game! Your COUTURE TEE will be hand painted, stenciled, and embellished just like the wonderful COUTURE TEE you see above. We will then create some awesome art based on the inspiration you give us. No super specifics needed, no proofs, all trust:) The finished product we create from your ideas will be marvelously unique and one of a kind. 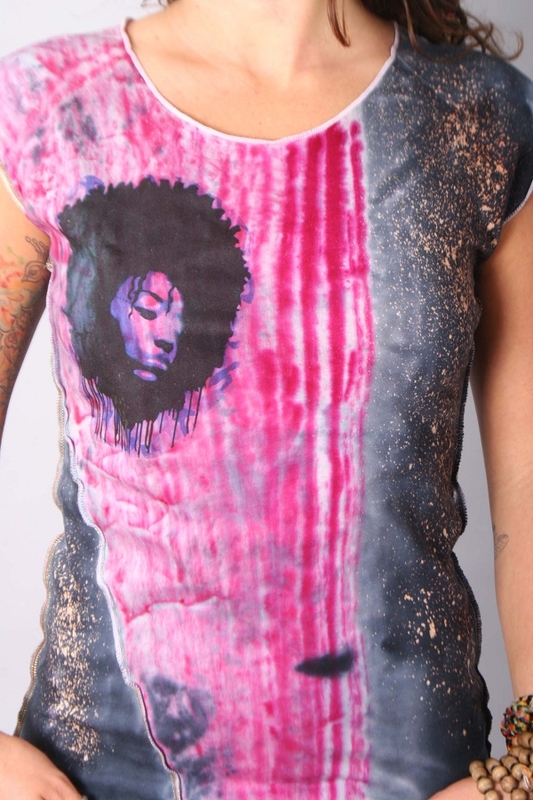 Limited run one of a kind COUTURE TEES made of an organic cotton/cotton blend embellished with original art pieces. MADE IN Boulder, CO & Los Angeles, CA USA. PLEASE READ OUR ABOUT US & POLICIES BEFORE PURCHASING. Note: Every yoga COUTURE TEE is made to order by an artist. Artistic inconsistencies make every reproduction unique and yours. No one else will have a COUTURE TEE quite like yours. FOR A LOOSER FIT AS SEEN ABOVE ORDER UP ONE OR TWO SIZES. Artistic inconsistencies make every reproduction unique and yours. No one else will have a garment like yours.